When blogger friend Carolyn reported that 2013 was the year she found herself saying "something's better than nothing," it really struck a chord with me. She has since moved on to "life is a marathon, not a sprint," but I think I'm going to co-opt her 2013 motto for my 2014. Because I get tired just talking about marathons. Or sprints. Or running, period. Right! "Something's better than nothing." Even if I can't do everything, even if I can't do it perfectly ... every little bit helps. I can spend a few minutes every day, or every weekend, trying to address some areas of chaos or anxiety in my environment. So today, I filled a huge bag with clothing to donate. Things that are too small, or too large, or shabby, or just never got worn, or didn't make me feel good about myself ... gone, to a new home! There's still a lot to be done, but it felt good. "Something is better than nothing." This sure beats the hell out of last year's "motto" which was something more like: "Oh my goodness, the thought of that is so overwhelming; I think I'll just sit here and cry." Baby steps! Seriously, how long am I going to wear skirts that are so tight I have to leave them partially unzipped (embarrassing but true)? I'm over it. GET OUT OF MY LIFE. Anyway. 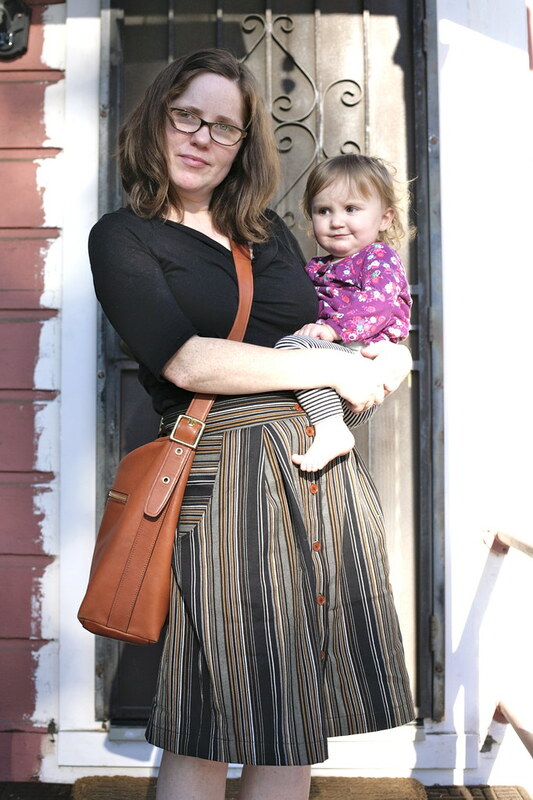 The point of today's post: Out with the old and ugly, in with a cute new me-made skirt! That fits! 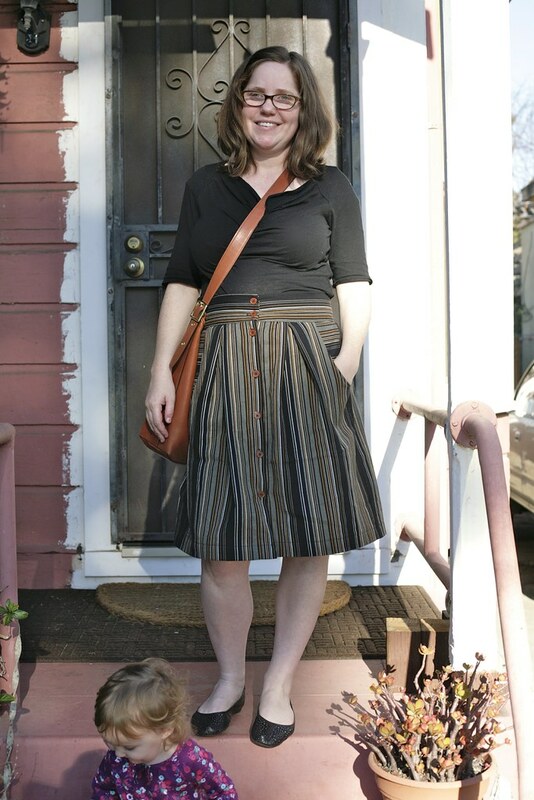 This is Megan Nielsen's Kelly Skirt, in a striped black and brown denim I bought at Britex a couple of years ago. This is my second version of this skirt (my first version, which I still wear frequently in warm weather, is blogged here). It's an easy pattern, and the final result is one of those garments you feel good in and actually enjoy wearing. I asked Steve to photograph me on our front porch, on my way out to run some errands, just to mix things up a bit. I don't think I like it - our Oakland-standard-issue security screen is on display, and you can see that we haven't touched up the paint since we installed the new door. That project is so low-priority, it's not even on the list. But hey, this is what I look like heading out the front door. It's different, anyway! Separates: I definitely like dresses, but I get a lot more wear out of separates. Skirts: I don't wear pants very often. My daily uniform is a skirt, top, cardigan, or jacket. Knits: Knits are comfortable and flattering and wash well (no ironing). Shapes: I like my tops blousy. Body-conscious is fine, but tight or uncomfortable is a no-go. Color: I am drawn to darker and more sedate colors, especially in the winter. I wear browns, blues, greens, and earth tones the most. I love bright colors, but the honest truth is that I rarely wear them. Prints: I love printed tops, which look nice with all of my solid skirts. I love stripes and plaids all the time. Quality: I wear items more if they are well made with quality materials. It doesn't make sense to be penny-wise and pound-foolish with fabrics (or try to cut corners) for items that I hope to wear for years. I don't imagine that I will ever sew my entire wardrobe. I'm a lawyer, and I wear suits a lot. That is far outside my skill set. Also, I'm a lawyer, and I don't have time to sew my whole wardrobe. But I can definitely sew some items that will live in that realm between business-casual and weekend-wear. So, okay. I let all of this percolate a bit and in the meantime, I whipped up the Plaintain t-shirt (printed, blousy, knit) and this skirt (striped, black and brown, skirt). Both nicely finished and in higher quality fabrics that will hopefully hold up well. That's the idea, anyway. To avoid pattern matching, I cut the waistband and pocket lining on the cross-grain. I like how this turned out, but in future, I will probably do the pocket lining the same as the rest of the skirt. Live and learn. 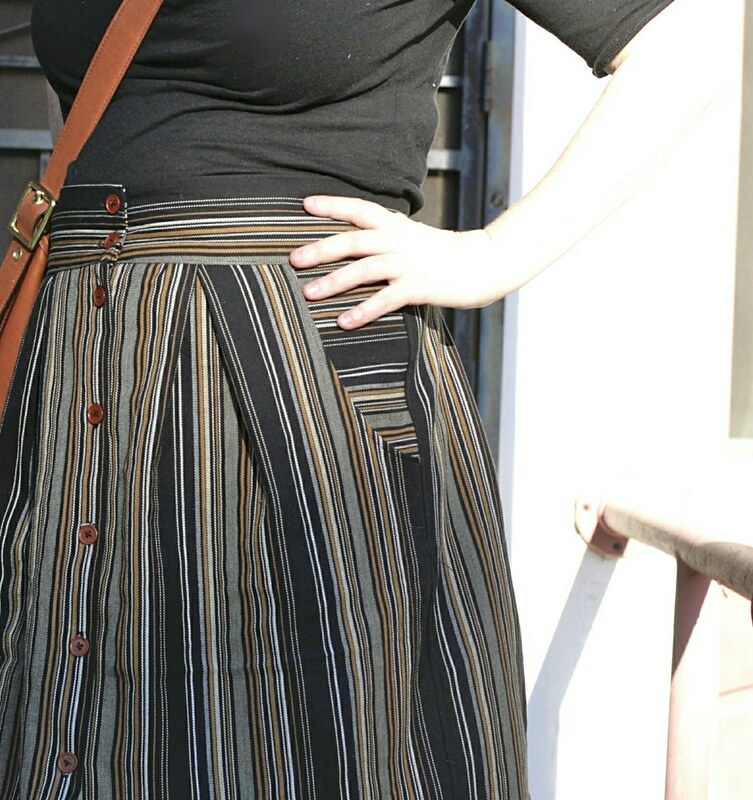 I am really happy with this skirt, despite the total lack of stripes-matching all around. One day I will learn how to match stripes! (In my defense, the repeat pattern on this stripe was huge, and the stripes are asymmetrical). Maybe next year. This year - something is better than nothing! Well, Maggie may still be skeptical, but I love those stripes! Pretty sure I'll be wearing this skirt a lot in the coming year. Are any of you trying to pare down and sew some wardrobe basics? Do tell! You look beautiful Inder, I love your whole outfit, it really suits you. I agree with so many of your points in this post but the one that resonates with me the most at the moment is trying to use good quality fabrics - I'm just starting to come to the realisation myself that spending all this time and effort making something to then not wear it becuase the fabric isn't right is crazy! Somehow it's hard for me to spend much money on fabric but I think I'm going to have to try to choose wisely in future. It does look fabulous on you! This would be a skirt I would wear a lot. ooo, Inder, lookin good! this looks great on you and i love the photos of you and M.
I like "it's so low priority, it's not even on the list" as a mantra, ha! So much of that around here too. Love the skirt, and the top. That's such a flattering outfit on you and looks really 'you'. 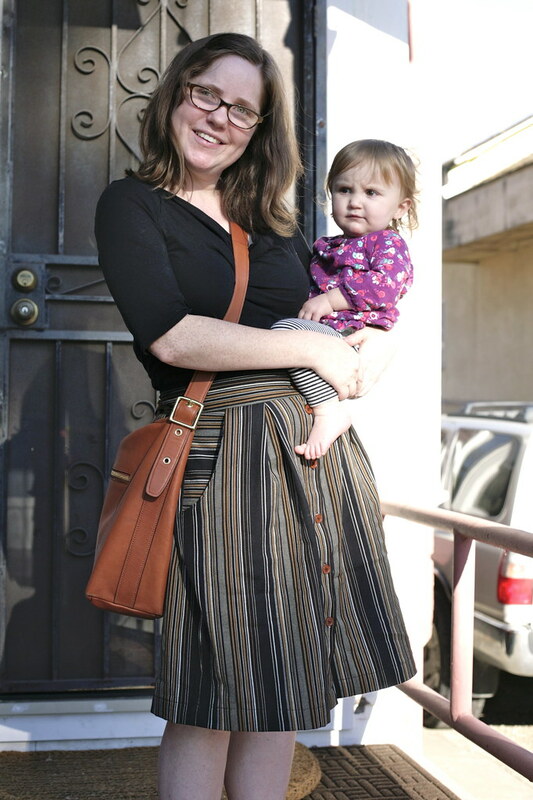 Great skirt, and such a cute outfit! The only thing my wardrobe really lacks right now is trousers. I'm hoping to make a few pair, as well as stash-bust by making lots of simple shift dresses. I found you through imaginegnats. I love your work and your blog. Your children are adorable. I'm a new follower on bloglovin. Thanks! Inder, this post is great! I also have so many things that just don't for properly so I'm happy to sew a few things that do fit! The skirt is so cute and I love the colors and style. Looks great on you! cute skirt! it looks great on you :) and i struggle with all or nothing myself, so i think i need to remember there's a middle ground there too. Inder, you look smashing! I love that skirt. I feel you on the struggle, friend. Keep on focusing on what you can do and progress already made. Thank you! I did lengthen it slightly by cutting it out in the M width with XL length. I prefer my skirts to hit closer to the knee so I knew when I bought the pattern I would want it to be longer than pictured on the model (I am not tall - only 5'4" - but this pattern hit me above the knee as drafted). Since I needed a longer waistband than M, I also shrunk the pleats just slightly to fit, so it is slightly less full.